I still remember that day, more than four years ago, when OnePlus came out of nowhere with its promise “to spare no expense” to bring us “the perfect smartphone.” Ever since then, the OnePlus handsets have consistently punched above their weight against the other flagships, especially in terms of build quality, performance and value. While the OnePlus 5 and 5T might have looked a little generic, design-wise, the company has upped its game with the OnePlus 6, while hitting pretty much all the checkmarks: the latest specs, better cameras and slick performance, all packaged within a beautiful new glass body. Even with a slightly higher price, starting at $529, the OnePlus 6 is a desirable handset — and one that can stand toe to toe against the likes of Apple and Samsung this year. The OnePlus alert slider is now located on the right side.Build quality has never been an issue for OnePlus devices, and the 6 is no exception. When it comes to form factor, the jump between the 5T and the 6 is a relatively small one — down to the near-identical width and height, the subtle curvature across the back and the rounded, tapered edges all around. OnePlus’ unique alert slider is here to stay, except it’s been moved to the top-right corner. The phone is comfortable to hold, and, with a gentle weight bump to 6.2 ounces (177g), it strikes a nice balance between portability and premium feel. The major difference with the OnePlus 6 is that the series has finally ditched the full metallic approach, replacing it with a glass-clad design. It comes in three flavors: a glossy Mirror Black that gives off a ceramic-like shine, a matte Midnight Black with a softer finish and an equally smooth matte Silk White, which is wrapped in a rose gold frame. I got the Mirror Black with 8GB of RAM and 128GB of storage. Unlike with the ceramic OnePlus X, from 2015, or the more recent Xiaomi Mi Mix series, OnePlus chose to mimic the special material using glass. The company managed to achieve the same elegant look, but without the brittleness, extra weight and higher production cost of actual ceramic. This obviously requires additional work: Once the glass is bent into shape, it goes through an additional five-layer coating treatment, and the result is a convincing ceramic finish that helps highlight OnePlus’ signature curviness. What pleases me the most about the OnePlus 6’s design is how the company is once again embracing symmetry, particularly with the central, vertical placement of the camera module on the back. It just looks a lot more premium on that gently curved surface. Perhaps it is a little ironic, then, that the OnePlus 6 is the latest smartphone to join the notch party. Over time, the notch has started to grow on me. 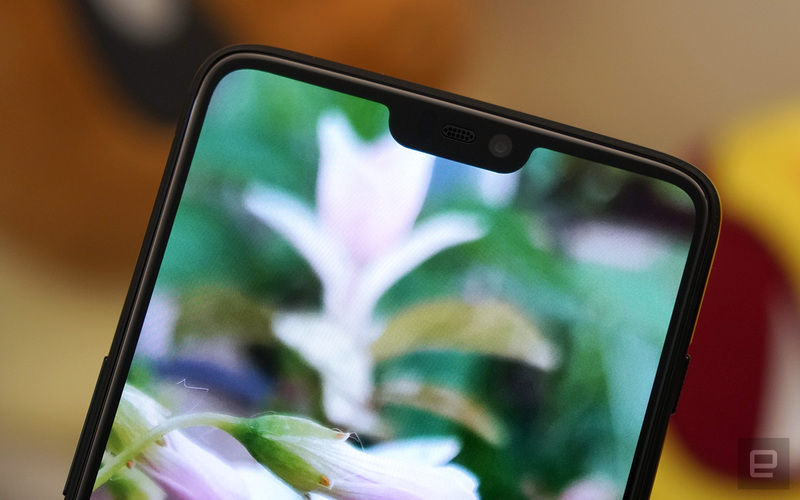 It actually makes perfect sense, given OnePlus’ return to symmetry, design-wise: it’s either the notch or having to somehow blend the front camera into the chin. As someone who eventually got tired of more bizarre selfie-camera solutions, the notch approach is far more elegant and painless. But if you absolutely can’t stand the notch, you can still hide it with a black bar in settings. With the additional screen space surrounding the notch, OnePlus’ stunning 1080p AMOLED screen now comes in at 6.28 inches wide, with a long 19:9 aspect ratio, covering a good 84 percent of the body. It’s an excellent screen — plus there’s power-saving advantages to this resolution — but if I must nitpick, it would have been nice if it were a little brighter. 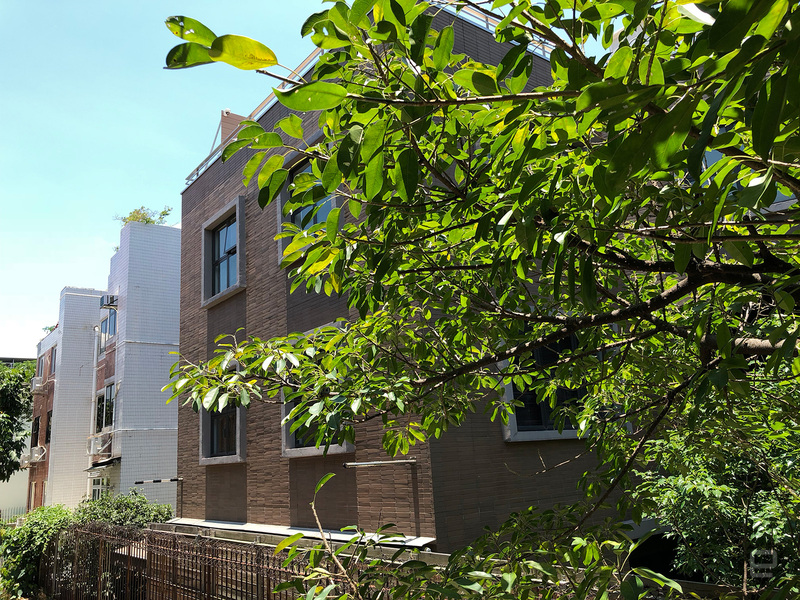 That’s not to say the OnePlus 6 is useless under the sun; the screen manages on most days, but I’ve found that it can be hard to read with the intense summer sunshine here in Hong Kong. Meanwhile, LG manages to tackle this problem by offering a 1,000-nit super bright mode on the G7 ThinQ’s LCD. It’s something that’s simply not possible with current OLED-based displays. When it comes to software, you won’t find any AI gimmicks, bloatware or heavy skinning on the OnePlus 6; instead, you get a clean interface with a buttery-smooth response. I’ve been enjoying this Android 8.1–based OxygenOS a lot: I’ve yet to experience any lag or crash. Of course, Qualcomm’s top-tier Snapdragon 845 chipset plus the 8GB of RAM in my unit deserve some of that credit. OnePlus’s engineers have apparently labored over scrolling and transitions to make them as smooth as possible — and it shows. My favorite software feature is the new set of navigation gestures. With these, I get to fully appreciate the extra screen real estate: Gone is the navigation bar at the bottom, and instead I swipe up from the middle of the chin to go home, swipe up and hold to see recent apps, or swipe up from either the left or right side to go back. 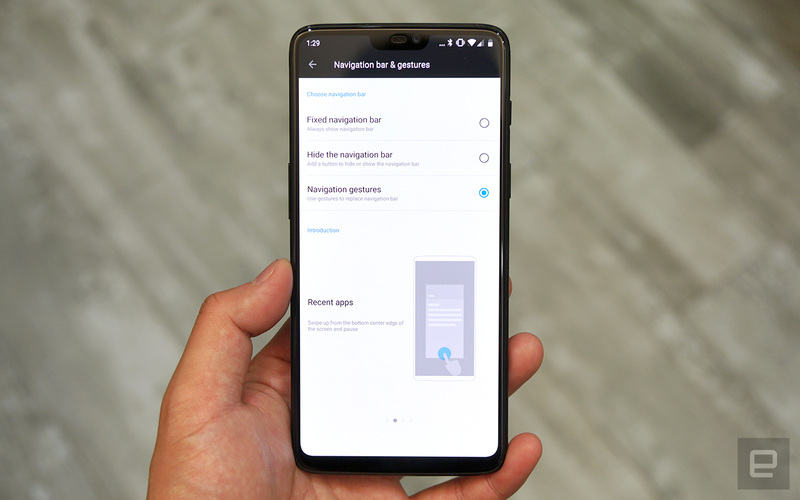 I was already used to the similarly intuitive gestures on the iPhone X, so soon after I enabled navigation gestures, I fell in love with my OnePlus 6 for the second time. Given that the 3,300mAh battery here is pretty standard, I did wonder if it would be enough to sustain the OnePlus 6’s slick performance. As it turns out, I had nothing to worry about. Over the past few days, I’ve seen my OnePlus 6 lasting for between 13 and 18 hours on a single charge, with the former including a smooth round of PUBG Mobile, several video streams over LTE and a fair bit of camera usage. It’s safe to say that on any normal day, this phone will have plenty of juice left by the time you get home. But if you do end up with a depleted battery, the bundled Dash Charger takes only about 30 minutes to pump it back up to 50 percent, then a further 80 minutes to reach full charge. OnePlus is sticking to a similar dual-camera formula, consisting of a 16-megapixel main sensor and a 20-megapixel secondary sensor for bokeh effects. This time, it’s finally giving what the users have been asking for: optical image stabilization and larger pixels for the main camera, with 480fps super-slow-motion capture at 720p on the side. OnePlus says it will also be adding a new Portrait Mode to the 16-megapixel front camera later, which will rely on an AI algorithm to add stars, hearts and other decorations at a matching level of focus (or blur). 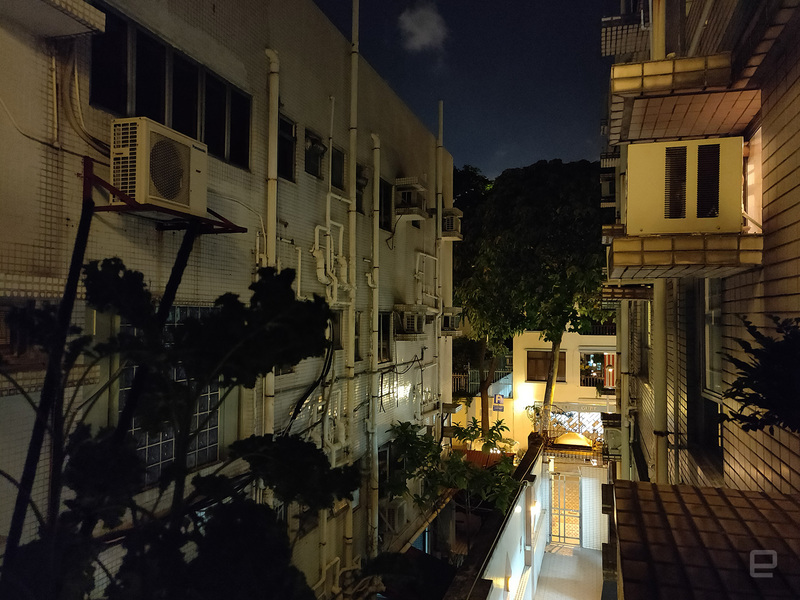 Night-time shot comparison: OnePlus 6 vs. OnePlus 5T.What impressed me the most here was the vast improvement in low-light performance on the 6. 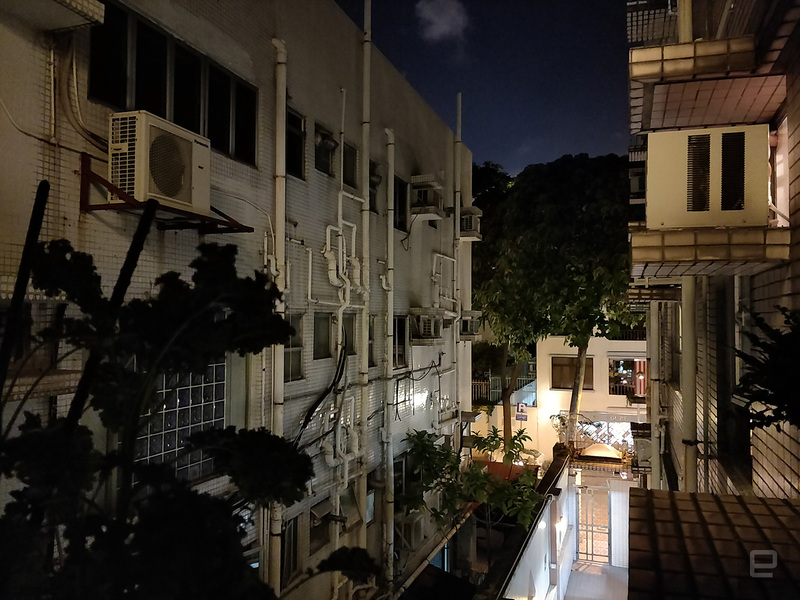 When in darker conditions, the 5T switches to the secondary camera and combines pixels to boost sensitivity, but it loses a great deal of detail in the process. That’s not the case with the 6: As I compared my nighttime shots side by side, I noticed that the newer model sticks to its much improved main camera, which is able to produce sharp and accurate low-light shots on its own. I even tried long exposure on the streets, and to my surprise, I was able to get many steady and stunning handheld shots. Don’t get me wrong, though: I can still see some noise in certain parts of the photos, but at least they are well contained and tend not to be that obvious. Rest assured, daytime shots taken with the OnePlus 6 are also impressive. The colors pop out accurately, especially in my landscape and foliage shots. I’m further impressed by how I can see individual strands of hair in my dog’s quick portrait shot. Similarly, the electronic image stabilization worked well in many of my video clips — it’s almost as if I had my phone on a gimbal, so long as I didn’t move the phone around too quickly. 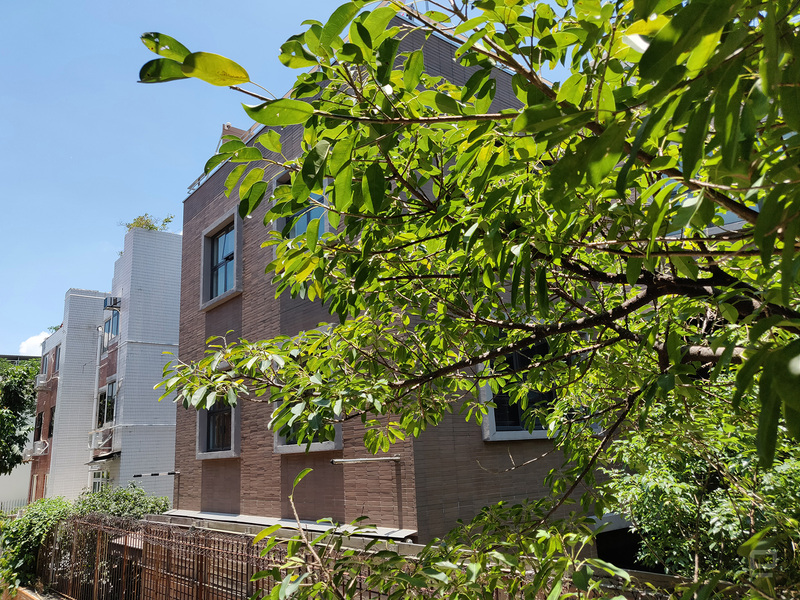 The 5T achieves similar stabilization results, but, in both videos and photos, it misses out on some color and warmth, as well as detail in the dark areas. Outdoor shot comparison: OnePlus 6 vs. iPhone X.Comparing with my far more expensive iPhone X, I’m still surprised by how the OnePlus 6 comes out with more accurate colors and clarity in most situations. In my outdoor shots, the iPhone X just about beat the OnePlus 6 in terms of sharpness, but I still prefer the latter’s colors. Bring the phones back inside and you’ll have OnePlus 6 as the clear winner: Its low-light shots are notably cleaner and more realistic, whereas the iPhone X has to make do with an unnatural brightness boost, while also suffering from heavy noise suppression. 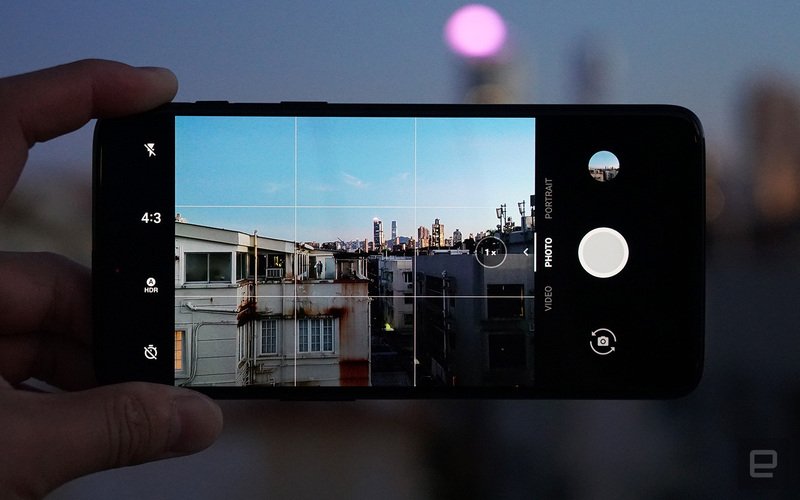 It seems that OnePlus has finally created a camera that’s ready to challenge those from other top-tier smartphones. 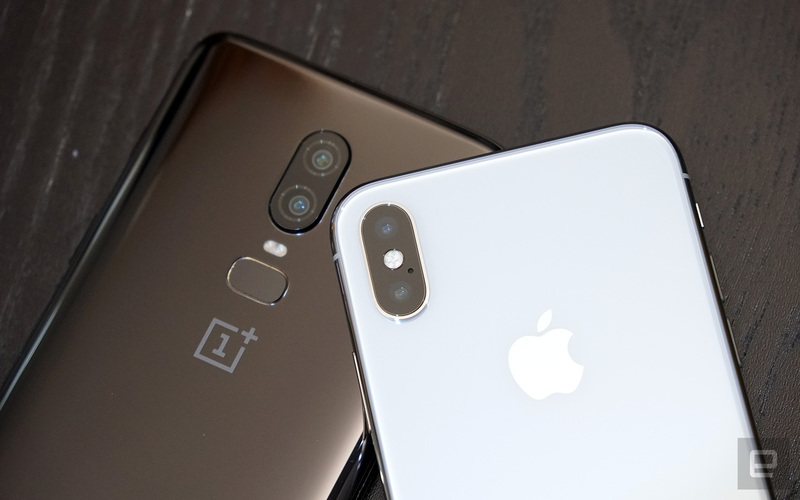 For a relatively small brand, OnePlus relies heavily on the loyalty of its consumer base, so the OnePlus 6’s biggest competitors are naturally its own predecessors. Many fans might not be convinced at first with that slight price hike, but the new flagship combines a fresh premium design with a much improved camera, plus up-to-date specs, making it an upgrade worth jumping on. In Asia, the OnePlus 6’s direct competitor is none other than Xiaomi’s Mi Mix 2S, which is priced and specced almost identically, and it targets a similar consumer base using a real ceramic design plus a screen sans notch — it has placed the selfie camera in the chin instead. That said, given the nature of both Android systems, chances are Western consumers will lean toward OxygenOS’ native Android-like look and feel. And besides, it’s unclear when or if Xiaomi will be bringing its current flagship to Europe by way of Three — let alone the US. For the rest of the world, OnePlus is all about tempting those who are seeking a top-tier flagship smartphone but don’t necessarily have the budget to splash on the likes of Apple and Samsung. There’s the Galaxy S9+, which packs similar core specs but with a starting price of $840 — about $310 more than what OnePlus is asking for. As per our earlier review, the S9+ is predictably capable, and those extra hundreds of dollars ensure a handful of extra goodies, including dual-aperture camera, a more powerful 960fps super-slow-motion video capture, microSD expansion, wireless charging and IP68 rating against water and other accidents. The LG G7 ThinQ may also be a worthy contender, with a similar display execution but more versatile cameras, crazy-loud speaker, military-spec ruggedness and, again, microSD storage; we’re just waiting to hear about its US launch. And last but not least, we have the iPhone X and the iPhone 8 series, but, based on my camera comparison alone, the OnePlus 6 already has a leading advantage on that end. 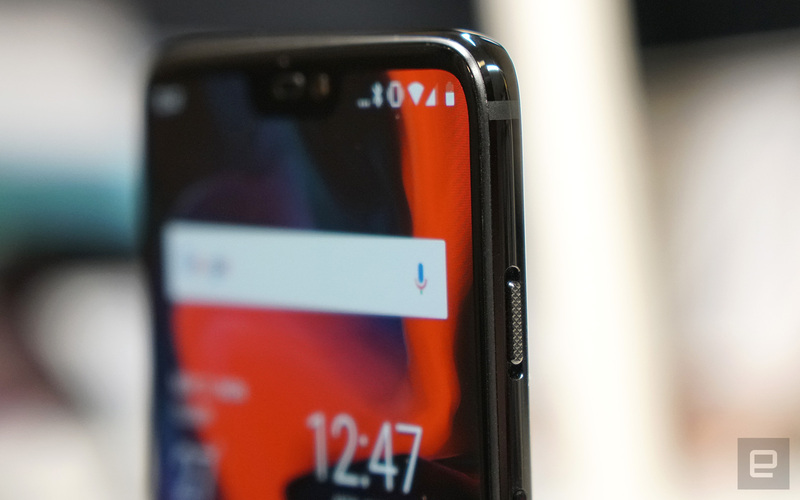 As a refinement of the already well-made OnePlus 5T, the OnePlus 6 is a big step toward the company’s vision of “the perfect smartphone.” Still, it depends on how one defines “perfect”; at least from a technical standpoint, the OnePlus 6 is stuck with a lower screen resolution than other flagships, and it never hurts to have a brighter screen, or wireless charging. 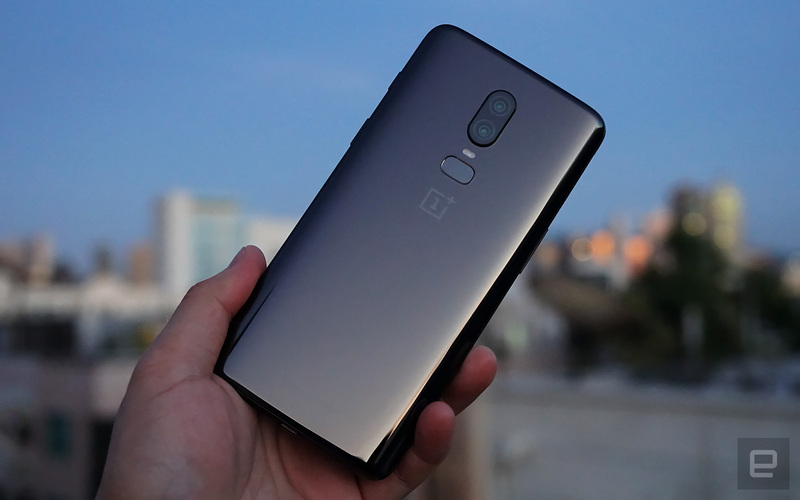 But for me, the OnePlus 6 has hit most of the sweet spots: This is a uniquely gorgeous device with intuitive features, as well as solid battery life and a great camera. Then I remember that attractive price. It may not pack as many bells and whistles as its competitors, but it’s not as if it’ll be needing those: Most of us don’t need AR Emoji, Animoji or AI-assisted camera filters. It’s safe to say that the OnePlus 6 will most likely win over existing fans, and hopefully win the affections of other buyers along the way, too.